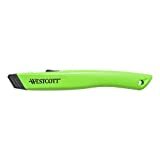 Westcott’s Full Size Retractable Ceramic Utility Cutter is not only capable of cutting the largest of boxes the blade retracts for easy storage! Allowing you to open boxes with ease. Perfect for home or office. Also, featuring safe and easy blade change.